Kennedy House – Built in 1822,belived to be first house built in Shimla. Residence of Charles Pratt Keneddy (Political Officer of the State). The Nunnery (1840 it was known as Alan Bank) : Called so because it was occupied for some times by three unmarried sisters. The Eagle Mount (St. Bedes college): Formerly Catholic Orphanage namely ’Chota Chelsea’. The Wheat Field: Now the property of Maharaja Of Darbhanga once upon a time it used to be surrounded by cornfields. Violet Hill – Situated on Jakko once owned by late Mr. W. S. Halsey and afterwards of Mrs. James is named after the flowers adorning the surrounding hills. Glenarm – this was once a hotel called ”Lady Kalab” by locals was favorite resort of “Grass widows” and unattached lady visitors. Near Annadale. Melville Lodge – For years was known as ‘Leopards Lodge’ because it was surrounded by thick jungle and leopards used to prowl through its Varanda. Count Quadt- German Consul-General Sir Robert Carlyle, Raja Sir Daljit Singh President of the state council in Kashmir. Torrentium House and Estate: It is so called after its owner Major General – R. Torrens, C. B, formerly Audjutant. Gen.of the Army. This estate was once called the ‘Roseville’ from the numerous rose bushes. There used to be a lake surrounded by willows which was filled up to make a tennis court. It was purchased by Mr. W. J. Lister for 55,00 in 1916 and Managers of the Ayrdiff High School for girls acquired it in 1919. Oakover: The well known residence situated at the head of Khyber pass was the Shimla stay for Maharaja of Patiala. He also owns ‘Rookwood’, ‘The Cedars’ and ‘Cedars Lodge’, another pretty bunglow in Kufri. Kelvin Grove – Formerly Head Quarter of Royal Air Force Situated on the lower slope of Jakko. Kelvin grove was built by Mr. Campbell About 1850. First it used to be a general store, 1865 it was ’United Bank of India’. 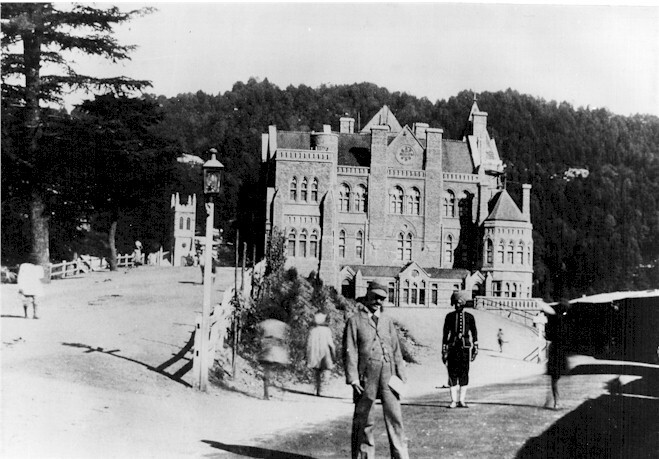 Ravens Wood – This is also one of the ancient house of Shimla, it was the residence of Mr. A. o’meara for many years. The only dental surgeon of those days Punjub, he came to Shimla in 1850. He was so famous that once Amir of Afganisthan Abdur Rahaman had sent for him. 1867 ‘Ravens Wood’ became the property of Mr. F. Lushington financial secretary of government of India. Who lived there during his term in the office. It was later sold to Raja of Faridkot, who with the architectural aid of Mr. T. E. G Cooper made it into the palatial residence it now is. Alan Cottage – Also Known as ‘Regent House’ is situated close by on the main mall. It was formerly a ‘Poor house’ of Lady William Bentinck’s, where it is said she used to distribute blankets and food to needy people. Bridge View - Situated above the Combermere Bridge. This buildings patta was granted and signed by John C. Eriskine Sub. Commissioner, north-west frontier dated 8th December 1842. Crags – Situated at Jakoo, dating from 14th June 1841 was one of the largest house in Shimla, it was made to Dr. C. B. Handyside by the political agent. The most famous occupant of the house was Colonel Mackezie and Major G. Broadfoot. Mr. Broadfoot had led the Mutiny veterans in their never to be forgotten march into the arena at the Delhi Durber(court) on the on the 1st January 1903. Rothney Castle – It is situated above the ‘Crages’ high up on the Jakko. This was first known as ‘Rothney house’ and was built by Colonel Rotheny in 1838. He sold this house to Dr. Carte who started the ’Shimla Bank Corporation’ in the house on the 19th November 1844. It was afterwards sold to Mr. A. O. hume then a secretary to the Government of India. He converted the house into a varitable palace. Mr. Hume, a grandson of the celebrated politician Joseph Hume. The Priory – These house was constructed by Captain Sunderlan, R A, occupying a position of Jakko about fifty feet above the road leading to ‘Snowdown’. ‘Priory’ was chiefly remarkable for the exhausttion of the little cellar. One of the famous residents of ‘Priory’ during his Short stay in Shimla was Prince Alexis Soltikoff, who wrote a book of Indian senses and character in 1858. Sterling Castle – It is one of the oldest house in Shimla, it was occupied by some of the famous personalities like Sir Fredrick Currie, Foreign secretary to the lord hardinge and afterwards a member of council during Lord Dalhousies term of office. 1870 it was bought by Mr. Cotton, a well known Shimla merchant. Sir W. W. Hunter wrote his ‘History of Indian people’ from this house. Kelston – It is situated on the Elysium hill. Kelston was the property of widow of Mr. H. S. Harington formerly Agent and chief engineer of Shimla-Kalka Railway. In 1850 the house, which was then known as ‘Elysium House’ belonged to the Roman Catholic Society and was used for Co-education School. In 1893 Major Kemp purchased this house to run a dairy farm, he lived into this house till 1900. Petersfield – This is another fine house with a fruit orchard on the Elysium Spur. First for about twenty-five years it was the property of well known Shimla merchant Mr. Townley. Some other distinguished tenants were- Surgeon General Cunninghum, Count Luxburg; German Consul-General of Argentine fame, in the great-war. Later This house was purchased for 1,60,000 by Maharaja of Bharatpur. Dalzell House – This is one of the house worth mentioning at central Shimla. This house was once occupied by Bank of Upper India; in early years it used to be occupied by civil Surgeon of Shimla and it was named after Captain the honorable H. B. Dalzell. In May 1907 the property was purchased by the Bank of Bengal for 1,30,000 and the old house was pulled down and came to its present shape of ‘Imperial Bank Of India’. North Bank – It used to be the head office of Countess of Dufferen’s Fund. It was also the office of ‘Oureday’ in India in 1917. When Sir Bayley the Lieutenant-Governor of Eastern Bengal and his wife were living in the house, it had fallen a victim of a massive land-slip. At this time Mr. Rudyard Kipling the famous author was staying with Sir Bayley at that time. The North Bank property also contains ’North Bank Lodge’ the office of Reuters’ Limited and associated Press of India. It was later purchased (the whole estate) by Rana of Koti, one of the neighboring hill chief whose territory forms one of the boundary of the station. Bantony – It is According to Mr.Buck one of the most striking house in the centre of the Hill station, The residence of Maharaja Of Sirmur (Nahan). During the war it was handed over to the government for temporary army headquarter. Knockdrin – A well known house in the main Mall just below ‘Kennedy House’. In 1862 it was owned and occupied by General Butler of the old Indian army. It was acquired, enlarged, and its name changed from ‘Will Hall’ to ‘Knockdrin’ around 1868 by Captain Levinge. Sir A. U. Fanshowe, the former Post master General in India lived in this house as well. During Mr.Bucks time this house was sold for one and half lakhs by Colonel H. K. Burne who was at that time Military secretary to the Government of India to Maharaja of Faridcot. Sir Mortimer Durand during his period as Foreign Secretary to the Indian Government also stayed in this house. In 1913 ‘Knockdrin’ was regarded as the residence of the foreign secretary to the Government of India. Tendrils – Situated on the ‘Choura Maidan’ in 1844 it was a small cottage Known as ‘Tendril cottage’. About 1850 it passed into possession of Mrs. Barlow Colyear and was sold by auction on the 29th June 1850 by the Shimla Civil Court, in the suit of Mr.David Colyear vs. Mrs. Barlow Colyear for Rs. 2,410, and being bought by the former. This house was later sold by Mr. Colyear for 1800 to Mr. H. R. Cooke. Mr. Cooke sold this renovated house for 45,000 in 1902 to Mr. R. Hotz, then a well-known photographer of Shimla who re-christened it the ‘Hotel Cecil’. Hotel Cecil made famous by Mr. J. Falette, who was honoured by His Majesty king George M. V. O.
Holcombe – Situated just opposite ‘Cecil’ was for many years the property of Mr. J. o’conor, C. I. E a late Director- General of statistics to Government of India and then known as ‘Jims Lodge’. Holcombe afterwards became the property of Mr. Everard C. Cotes a well-known Anglo-Indian Journalist and in here Mrs. Everared Cotes (Sara Jeannette Duncan of literary fame) wrote more than one of her delightful books. Bonnie Moon – Situated high up on Jakhu was one of the oldest boarding houses in Shimla and here were the curious and valuable museum belonging to the Colonel Tytler of the Honorable East India Companies Service. The museum chiefly consisted of a large collection of birds from all parts of the world, including animals and shells from the Andamans, oriental manuscripts, and geological, mineralogical specimens.